We love making pies in colder weather and today I have a tasty Welsh Lamb and Pumpkin Pie recipe to share with you. Pies are such great Autumn/Winter comfort foods and this pie recipe is made with ready-made puff pastry so it is quicker than making it all from scratch. Whats not to love? Heat oil in a large pan, add onion and brown slightly. Add the cubed lamb and brown well. Add the cumin and stir well. Then add the pumpkin or squash, stock, sultanas, pine nuts and season well. Add one sprig of rosemary, put lid on pan and allow to gently simmer for about 30 minutes. Remove from heat and ladle into a ‘family’ sized pie dish or four individual pie dishes. Reserve a little juice if quite a lot and save this for additional gravy. Remove the packaging from the pastry and press into it (with your clean fingers!) small pieces from a sprig of rosemary. Take a rolling pin and roll out the pastry to fit the pie dish (pressing in the rosemary if it falls out). Place pastry into dish, brush with egg and milk glaze, and place in preheated oven at Gas 6, 200ºC, 400ºF oven for about 25 minutes until the pastry is risen and golden brown. Serve with a heap of seasonal green vegetables. Eat Welsh Lamb And Welsh Beef. 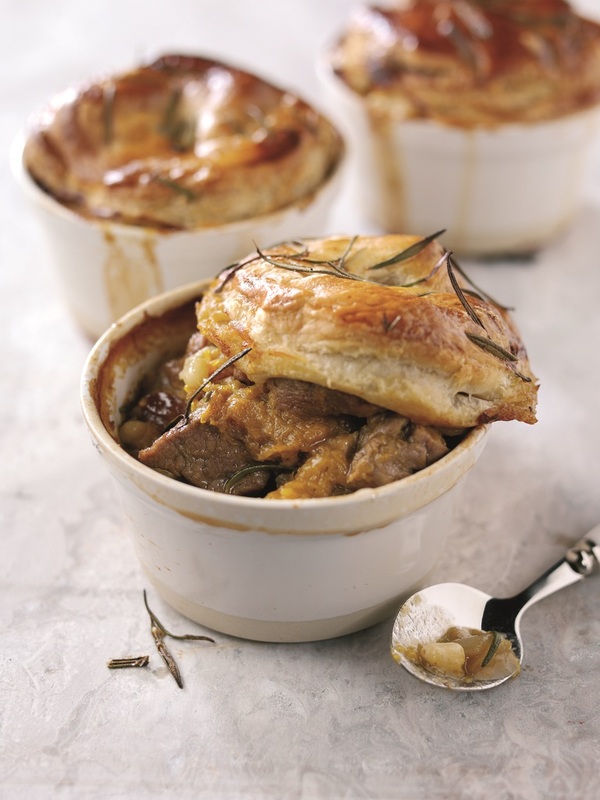 What do you think of these Welsh Lamb and Pumpkin Pies? Share your thoughts in the comments below. Rainy Days And Monday Blues ..
"Spider’s Web Pancakes: Creep Crawly Halloween"
That looks fantastic! Great pic also. I'm getting better at my photography for my blog…slowly but surely.